KATIE SPAIN hits the streets with Puddles the clown to see if she can put a smile on his dial. 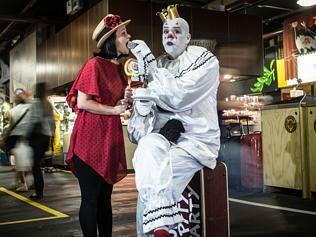 The giant clown strides through Adelaide Central Market, a small illuminated lantern in hand. He’s dressed in white and his face is painted to match his clobber. Atop his head is a small gold crown emblazoned with the letter ‘P’. He plonks a suitcase on the floor, adjusts his baggy silk pants and sits on it, solemnly taking in his surroundings. He’s not amused. Sadness blankets his pasty face – highlighted by the thick frown scrawled across his noggin. He’s not just glum; he’s eternally, heart-wrenchingly sad. The clown’s name is Puddles and he’s in town for Adelaide Fringe. You can’t miss him. At 7-foot tall he is a head-turning spectacle. Jaws drop, children gawp and adults pretend not to stare when they catch sight of the big, white enigma. This is a clown of few words. In fact, he doesn’t talk at all. The only time the towering character makes a sound is when he sings but boy, what a set of pipes. 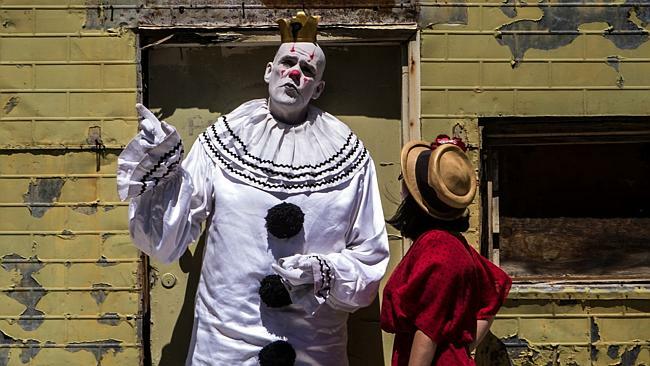 His Fringe show Puddles Pity Party hits the Garden of Unearthly Delights’ Le Cascadeur every night (except Mondays) and includes soulful covers of songs by the likes of Sia, The Bee Gees, ABBA and Metallica. When his version of Lorde’s ‘Royals’ performed with Postmodern Jukebox was uploaded to YouTube in 2013 it went viral, clocking up over 10-million views to date and went bonkers on iTunes. He counts musician Moby, Mad Men star Jon Hamm and actor John C. Reilly as fans, has sold out shows at London’s Soho Theatre, performed across the globe including the US and Europe with rock band EELS and his Fringe show has been met with rave reviews. He has a lot to be happy about but is still blue. 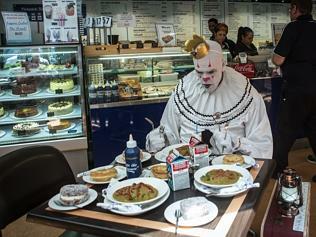 It’s a tough ask but before my close encounter of the clown kind I’m informed that Puddles has a penchant for coffee and food, particularly pies. “Come,” I say, hand outstretched. His white glove-encased digits engulf my tiny fingers and we’re off. I take three steps for every one of his. It’s like a shetland pony cantering next to a loping Clydesdale. Market-goers stop and stare. A teenager shrieks. Not everyone loves clowns. First stop is Lucia’s for a caffeine hit. “How do you take it Puddles?” His frown deepens. I don’t speak ‘mime’ so play it safe and order a flat white. The coffee is good but not smile inducing. Next stop Providore. If anything is going to make a giant human grin it’s a lamington. Nope. He takes a bite then breaks the treat up and scatters it on the floor, motioning for the pigeons on the street to come inside. Oh dear. “Okay Puddles, follow me. This next place is pure happiness.” I take him to Blackebys Sweets, a historic favourite with sweet tooths. The fairy floss and giant lollipops are enough to give a dentist a coronary but he just sighs. This is harder than I thought. Flowers. Everyone loves flowers right? Wrong. Peter at Central Market Flowers is one of the friendliest stallholders in town but even he can’t please my companion. Puddles attempts to eat the blooms then wanders off to place a red clown nose on an old lady as she passes by. The grey haired dear continues her shopping with her new red honker affixed, giggling like a teen. Puddles watches on solemnly. We order big. An iconic South Australian pie floater covered in pea soup, kangaroo pies, doughnuts with pink icing and vanilla slices arrive. We wash them down with Farmers Union Iced Coffee. Still no smile. Even larger than life boss Vili Milisit can’t turn the clown’s frown upside down. “We get all sorts in here,” says Milisit unperturbed. “All the stars … even KISS came in after one of their concerts.” Puddles looks mildly interested but not enough to be amused. Defeated, I drive my ginormous pal back to his hotel. On the way he rubs his tummy and gives me a look that breaks my heart. I think it’s appreciation but can’t be sure. As the rock cabaret unfolds the clown with the golden voice melts our vital blood-pumping organs with a soulful setlist. I finally get it. There’s no point in making Puddles smile. That’s his gift to the world. This super fan has a point. I’ve seen more grins on faces today than I usually do in a month thanks to this troubled, towering hulk. As the crowd exits the venue we’re kids again – basking in the childlike wonder most of us cast aside years ago. Puddles leaves us there, swimming in a sea of goofy grins, and disappears (frowning) into the night.